Ben Goldacre is a medical doctor who investigates the real effects of medicines & drugs and how pharmaceutical companies can absolutely legally hide unfavourable trial results. Even some academic papers which we believe are ‘objective’ and reliable are often planned, and written by people who covertly work for those same companies. He wrote “Bad Science” which just came out recently, read more about it here. If you do not have time to read through the whole book, watch this TED video which explains it all. Watch this interesting insight on information: we treat it as food. 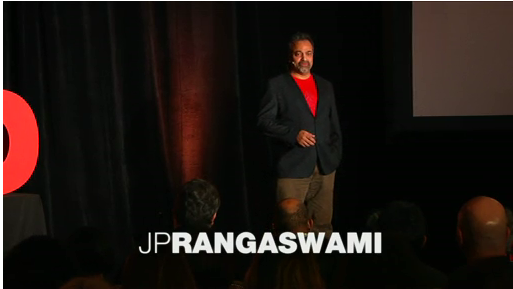 In this 8mn TED video, JP Rangaswami asks: “what would change in your life if you considered that the information you take in everyday is food”? He finds many similarities and points of comparison. We were hunter gatherers of information (free to roam) and moved to become farmers of information (create ownership). And there are as many ways to consume food as there are to consume information. Information as well as food as a “use by date” and, like food, major impact on the environment. Are we going to start looking for the ‘fact’ percentage? And what happens when information stops pouring in? Famine. He quotes Clay Shirky who said: ‘we do not suffer from information overload, simply from filter failure’. Fundamentally, food issues are consumption issues, so how do we create diets and exercise within ourselves to digest and use it responsibly? Apart from the interesting reframe on information, I found this musing interesting because this is exactly what NLP helps us to do. Have you ever taken a test, or assessment to discover who you are, what job best suits you, or which relationships fit you best? Do you know your “type”? Too many modern assessments and models put people in boxes: you’re an A-type, where you hang in the 4 quadrants, models of personality etc… As much as it is useful to discover certain character traits, those tend to limit us rather than assist us to expand our perception of who we are and how we are “supposed” to behave, because they tend to function deductively (from outside to inside) rather than inductively (from inside to outside). One of the first NLP techniques that I teach in our corporate trainings is a technique called ‘REFRAMING’. Although easy to perform, it is a very, I mean VERY powerful technique. So powerful in fact, that sometimes, it is the only technique needed to change a behaviour of even a belief. What is a “reframe” and when is it useful? The process of changing the context of a statement to give it another meaning. This is useful in answering objections raised by a prospect in a sales interview. What is the difference between “Contexts” and “Content” reframe? Context Reframing is giving another meaning to a statement by changing the context. Content Reframing is giving another meaning to a statement by recovering more content, which changes the focus. It is also called Meaning Reframe. Reframing simply refers to something we do all the time: the process of changing the meaning of a statement or situation.